So my crazy holiday schedule this year led to a last-minute plan for crafty Christmas gift tags, which turned out to be awesome! I love Instagram and have so many great pics of my family. I chose a couple of favorites and took a few more holiday fun ones of my girls. Then I copied the photos into a Word document and printed them out on cardstock. 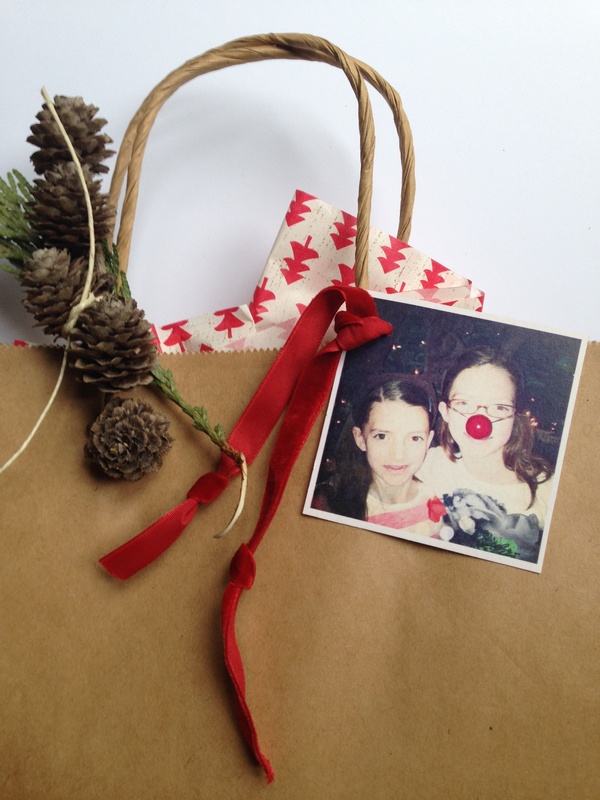 I’m so happy with the results, such a cool touch to my Christmas packages. It’s like an extra little gift on the gift – yay! My baby turned nine yesterday – I cannot believe it – and we celebrated in style with a lovely art party. My girls have been invited to a few art parties in recent years at different painting stores in the area. Sophie loves art, so we decided to do our own at-home version complete with real canvases for the girls to paint. For the art project each guest painted her own initial surrounded by different designs. It was a little rainy (typical June Seattle) so we had to set-up the painting in the garage instead of the grass like I’d imagined, but the guests didn’t seem to care. We served our favorite macaroni and cheese and sandwiches and had paint-your-own frosted cupcakes for dessert. I love the colors we chose – orange and aqua – and had so much fun picking up cool treat bags, candies, straws, flowers and decor to match. I bought the smocks at the craft store but sewed orange chevron pockets to the front and tied on some coordinating ribbon – an easy way to make a store-bought apron look homemade. 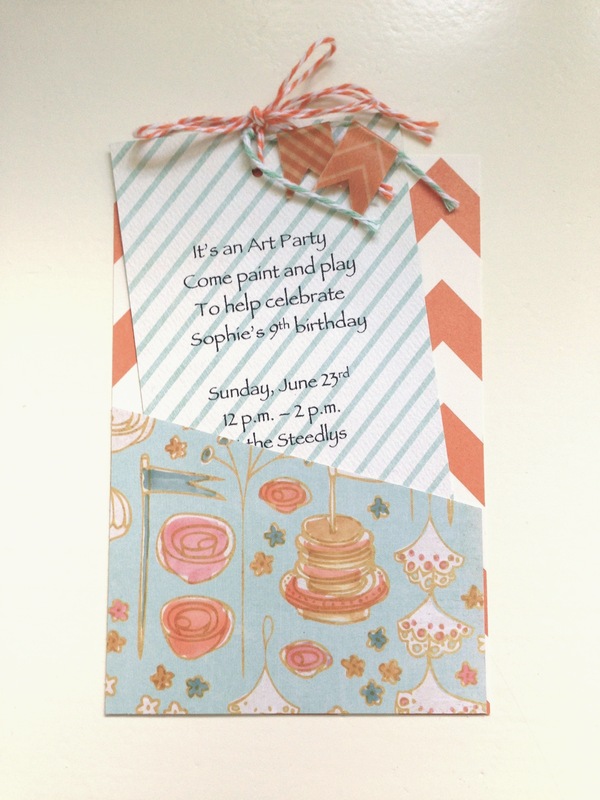 All and all, a simple and adorable birthday party that made my Sophie a very happy girl. And a happy girl makes a happy mommy!! I’ve read the blogs and the Facebook updates, and I stand in solidarity with those other frazzled and fried moms out there who, like me, are SO OVER this school year. 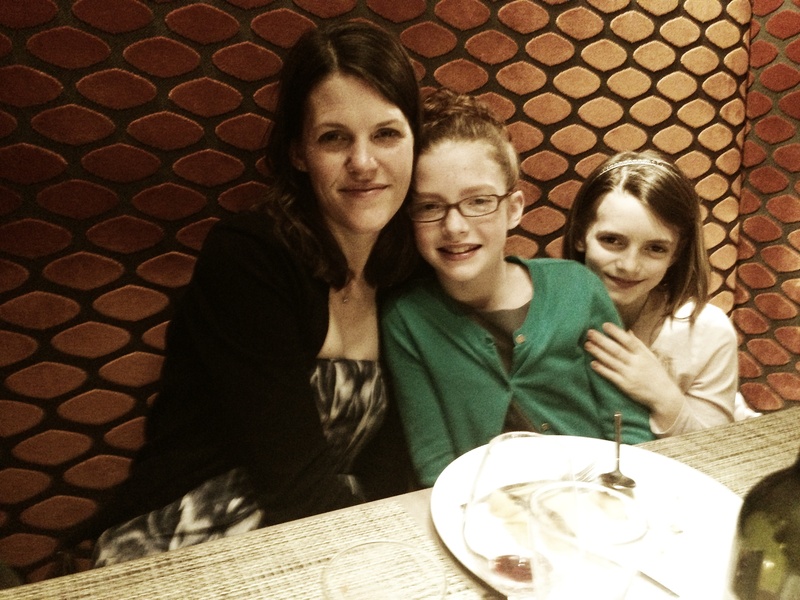 I’m done – ready for the summer and an end to the madness that is ballet recital rehearsals and teacher gift planning and end of the year parties and volunteer brunches and wrap-up meetings, etc. etc. etc. I’m burned out and sick of the missed deadlines and late arrivals and last-minute juggling. I’m ready for the happy lull that comes with sleeping in late and lounging around in your pajamas and letting the summer days take you where they want. So why then, you may ask, was I up ’til 2:00 a.m. a few nights ago making 18 homemade party invitations for my darling Sophie’s 9th birthday party? Because despite the fact that I’m tired and jaded and a little overwhelmed by my life, I’ve taken stock and decided that there are some little things that are just too important to let go. It’s crazy times like these that I need to remind myself of the things that truly make me happy, that define my family’s story and that make up the memories that we cherish year after year. For us, one of those things is our family birthday parties. I’ve always done a handmade invitation, and I always go all out to put together a special birthday celebration. For my girls, that’s one of the ways I show my love. And in all the chaos that is our life right now – not only wrapping up a busy school year, but also buying a new house and fixing it up – I don’t want to let go of what’s important to us. So I will find the time to make it happen. I’ll be late to the meeting and forget to bring the snack and bag out of another volunteer commitment, but I will not forget to slow down long enough to remember what matters. I’m exhausted, but I can rest easy knowing that we will have a few more memories to savor. It’s been a whirlwind couple of months: buying a new house, selling an old house (in that order) and turning 40! I’ve not had a lot of time to spare, but have been managing to squeeze every bit of fun out of this busy life as possible. We’ve just returned from a lovely Spring Break to Paris, a special trip in honor of the big 4-0. It was Drew’s idea that we celebrate my birthday in my favorite city, and who am I to argue? So even though the timing was a little crazy, we went for it and got lost in the world for a blissful week. 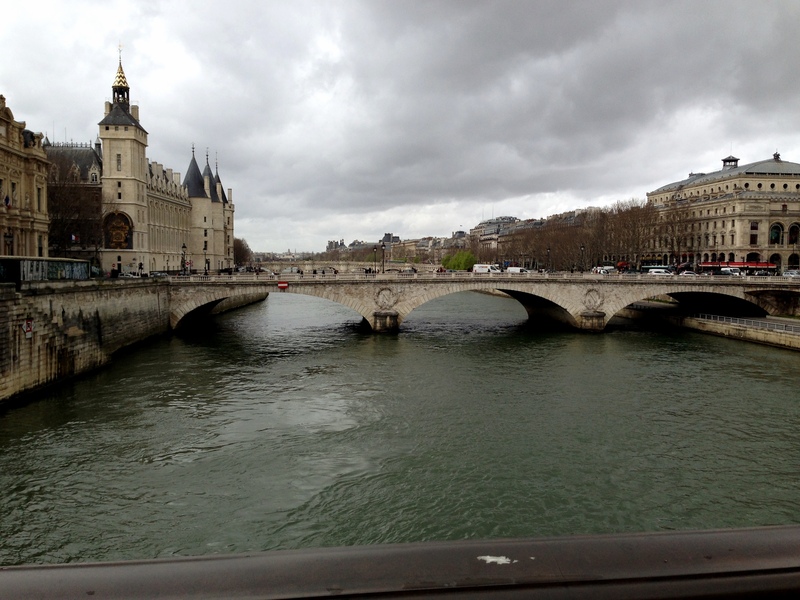 It was the rainiest visit to Paris I’ve ever had, but typical I think for the springtime. We weren’t able to do quite as much strolling and sitting around in parks, but that left more time for eating and drinking, both of which are so good there. We had many fun moments curled up in the booths of cafes and boulangeries and brasseries together. Since we were only there for a week, I relied on my iPhone for my photos and got to play with a few of the photo apps I’ve been so obsessed with lately. I had discovered Instagram a while back, but ever since my girls’ weekend in Chicago, where my friends Jean and Jen so kindly filled me in on the joy that is Picfx, I’ve been having so much fun playing with pictures and exploring several different and fun photo apps available. My current favorite is Camera+, and its “Fashion” FX effect is so cool. The only thing better for me than taking and looking at pictures of my precious girls, is taking the pictures and then getting to edit them over and over to my heart’s content – ahhhhh!! This is much to Drew’s dismay as he loves to tease me that there is no reason that a perfectly good picture taken in 2013 should look like it’s been dug out of a cedar chest circa 1973. But I say he’s wrong! There’s something alluring about these edited images, they seem somehow timeless. They’re fun, and they make me happy. This past Monday was the only day my girls’ mid-winter breaks aligned, so I decided to make the most of it by heading out on a little road trip with my brother. I feel so lucky that he moved out west and now lives only 15 minutes away from us, much to his nieces’ delight. We had no plan for the day but decided on a whim to try to find a fantastic little hole-in-the-wall restaurant we’d been to once before on a road trip when I first moved out here and he’d come to visit. We couldn’t even remember how long ago it was, except that my now eight year old was in a baby car seat. Jason thought the restaurant had the word “anchor” in the name or there was some sort of nautical theme – that and the fact that we remembered it being in one of the small waterfront towns near a ferry port north of Seattle was pretty much all we had to go on. It was fun taking off for the day and retracing the steps of our past adventures. And as soon as we hit the little town of Anacortes, with its quaint historic downtown, it all came back. We’d obviously been there several times since along with Adrift (the restaurant we’d remembered with the most amazing burgers and shelves filled with old books), we also came across a pizza place and a country-style restaurant that we remembered going to. After our lunch, we continued road tripping to the amazing – but terrifying – Deception Pass bridge. Heights like that freak me out, especially since having children, and I wouldn’t even let my girls go all the way out to the middle. Yikes!! But we parked and had a cool little hike down to the beach below. The girls had fun being outdoors and hanging with my bro, and I gathered a few more of the beautiful colored rocks that you can only find out here on the beaches of the Pacific Northwest. Not a bad way to spend the day! I get my inspiration from lots of different sources: friends, magazines, craft stores, Pinterest and, yes definitely, my children. Last year, we had a blast making our awesome owl valentines to exchange with friends and at school, but this year I was looking for a new project. 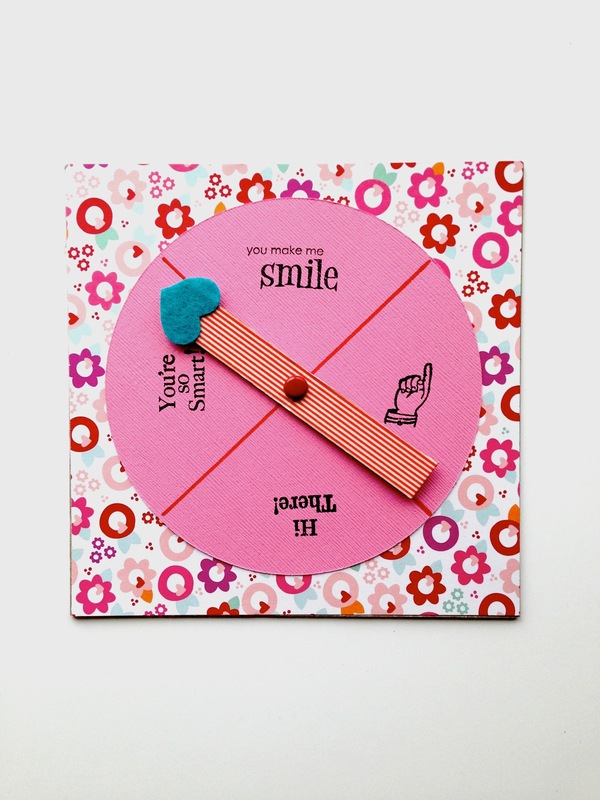 I asked Sophie and – out of the blue – she said, “I want to make game spinners.” Where did that come from? It was the spark I needed to get my creative juices flowing. I picked up a pack of 6×6 chipboard squares and some valentine scrapbook papers. We cut the arrows out of chipboard, covered them with Washi tape, and used a felt sticker heart for the tips. My girlie had fun assembling them and especially stamping on the cute messages. We taped a pixie stick to the back along with our to/from because according to Soph: “the kids really care most about the candy.” That may be true, but I like to think that the smiles on their faces might be just a little bit bigger when they see these super cool valentines. That makes me happy! 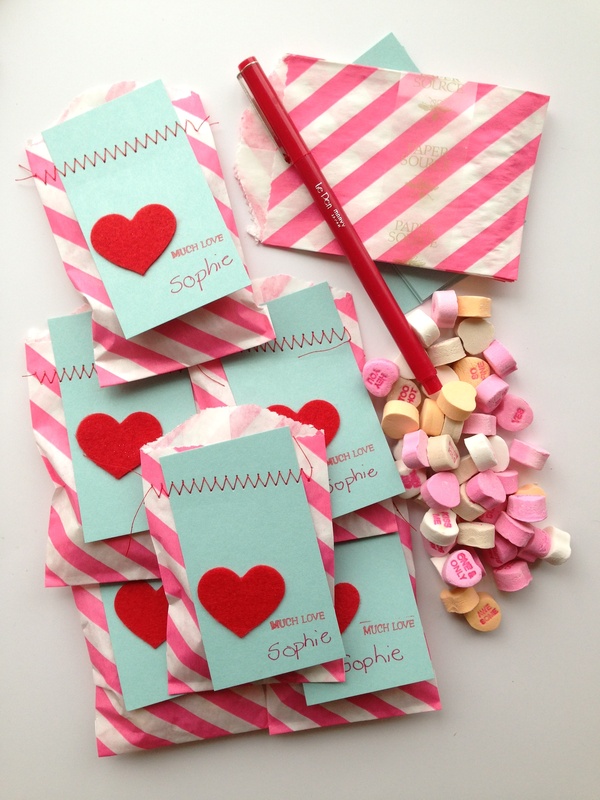 Sophie and I have had fun today assembling these sweet little Valentine’s Day treat bags for her friends. Inspired by a gift from my friend Stephanie and several Pinterest pics, I’ve been incorporating wax paper treat bags into my recent craft projects. There are so many of these bags on the market right now. I got mine at my local Paper Source store, and you can find a ton of really pretty ones on The Sugar Diva’s website. For Bella’s birthday craft party and for this project, I sewed the bags shut as an added touch. Some may think I’m crazy, but I think going the extra mile makes all the difference. Love is in the details! 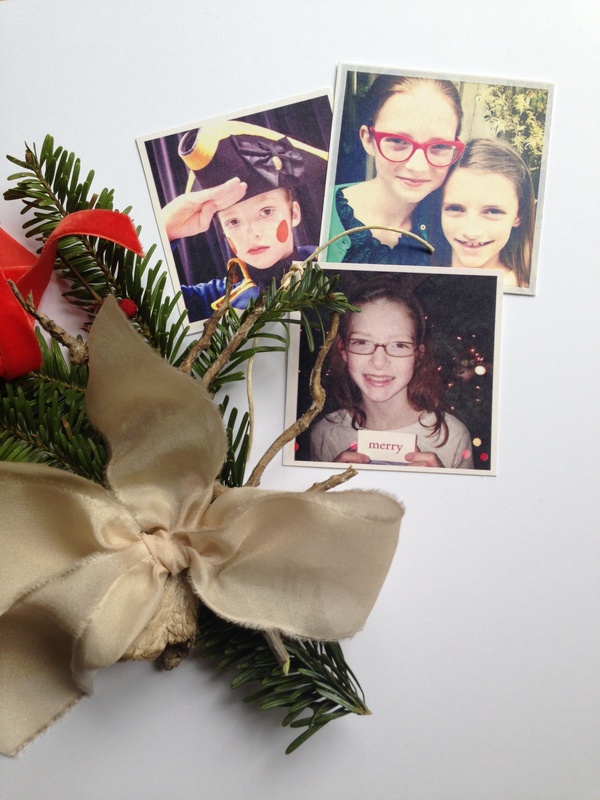 Carrie writes about her life, loves and family adventures. And like Laura Ingalls Wilder, "I am beginning to learn that it is the sweet, simple things of life which are the real ones after all."